Radio420™: K.Daver’s “Rotten Robbie” Tour Dates Available; Also Booking Certain Cities! 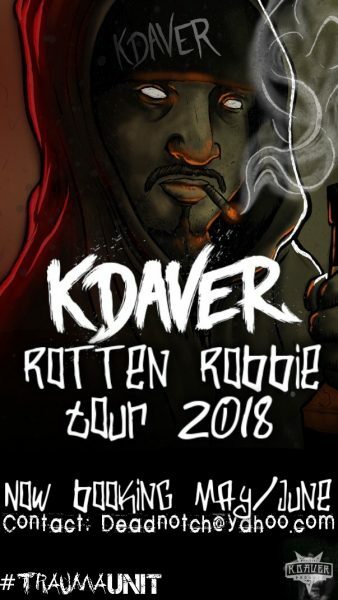 K.Daver’s “Rotten Robbie” Tour Dates Available; Also Booking Certain Cities! There are some gaps between cities that they’re looking to fill in, so if the routing makes sense, they could book a city near you too! They are really looking for dates in Iowa, Michigan, Nebraska, Illinois, and Kansas. If you are a promoter or venue owner and want more info on getting this tour in your city, hit up deadnotch@yahoo.com!